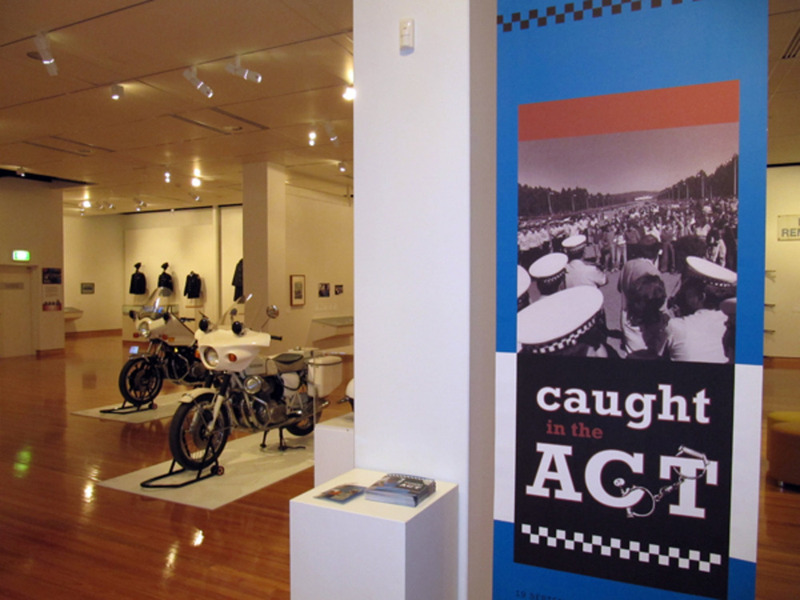 This exhibition explored the history of crime and punishment in the Canberra region since the early 1800s, exploring the growth of the ACT from rural settlement to capital city and the resulting change in both the types of crime and our methods of coping with it. The exhibition starts with an exploration of the settlement of the region, largely by convict labour; looking at Garrett Cotter (a convict after whom the Cotter River was named), convict bolters and bushrangers (including William Westwood, Frank Gardiner and Ben Hall). This leads into a discussion of the history of policing in the region, from the early days of police magistrates and lock-ups, through the period of having an organised NSW police force and the final development of the ACT’s own police force. In tracing the development of the police force, focus stories will deal with community policing (Kenny Koala and the PCYC), women in the police force, the development of forensic techniques and the change in police vehicles and technology. The final section will focus on the history of justice and punishment by looking at the ACT’s corrective services facilities. Starting with the old lock-ups in police stations, it will detail both the old and the new facilities that have been built in the ACT. Through photographs, the old Quamby Juvenile Detention Centre will be contrasted with the new Bimberi Youth Justice Centre. The Belconnen Remand Centre will be contrasted with the new Alexander Maconochie Centre which is now both remand centre and prison.